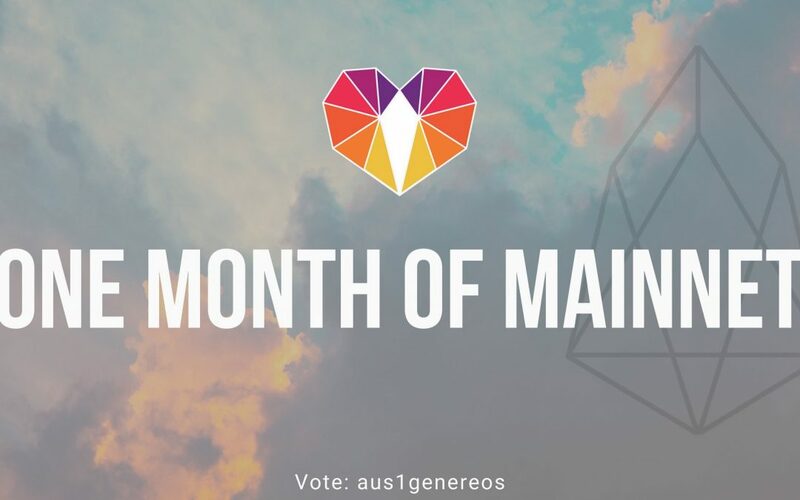 The EOS mainnet has been live for more than a month now, which is the equivalent of a lifetime in crypto years. It has been an amazing journey so far, and we are so grateful to be a part of it thanks to our voters. But we still have a way to go and we are not slowing down by any means. With so much happening, we thought we would take a moment to give a quick overview of some of the things we have been working on in the last month at GenerEOS, Australia. There are a number of proposals being thrown around the community to combat the high price of RAM. However, we took it into our own hands to give an alternative immediately for dApp Developers. The poormans token“Airgrab” is an opt-in alternative to the well-known “Airdrop” model. RAM is an essential component for dApp developers, especially when conducting Airdrops. The increasing cost of Airdrops has created a high barrier to entry, creating concern within the community for network growth. Through the introduction of the poormans tokens, we give an alternative method that opens doors for dApp developers that don’t have access to large amounts of capital. We are currently conducting tests on the poormans token to ascertain its efficiency. This is with the help of several dApp developers working together to launch similar models for their projects. The analysis and testing have been a success to this end, given the data of 1039 Airgrab claims for 7,249,468.9 POOR Tokens. We will be reporting our findings to the community and will continue to work with dApp developers to help deploy price efficient models for their projects. EOSToolkit.io has seen over 25,000 users in the space of 3 weeks. We are extremely happy to have created a platform that has exposed a large user-base to the great features of the EOS Blockchain. To ensure our users continue to adopt the technology, our tech team has been working tirelessly to bring more features onto the platform. Our aim is to make the platform as straight forward as possible with a seamless user experience. Also in the making is a multilingual feature to cater for the Korean as well as Mandarin languages. For those willing to help us in proofreading translations, kindly reach us through contact@3.87.34.8. We have remained diligent in implementing every single software upgrade beginning from DAWN to mainnet-1.0.9. Regular backups are critical to the coherence of our nodes. Therefore, we trigger hourly backups which additionally get pushed to our Amazon S3 bucket – we can share those backups with interested parties for complete transparency. We implemented semi-automatic recovery options for our nodeos for critical times of failure and are always working on further tightening our operations, performing code audits, improving monitoring and auto fail-over as well as participating in testnet operations to make sure we are ready to produce blocks when we are needed to stand-in for an active BP or when the community appoints us to be a top 21 block producers ourselves. We also developed a bash script for automatic claim rewards that we are planning on giving out to the Block Producing community to make life easier. We stayed true to our Candidacy paper and filmed our first Fireside chat interview with Mark Pey from SendGold. Sendgold is a simple and secure digital method for transacting and storing physical Gold. We talk about all things EOS, Money, and Blockchain related in a casual, relaxed environment. Mark has been in the industry for a long time and has a wealth of knowledge, we loved every bit of his wisdom. Fireside chats will be re-occurring every month or so with key industry leaders for the enjoyment and education of the community. There is a wide variety of meetups in Australia along with our very own that we host on a monthly basis in Sydney. We try and be as active as possible in the Australian Crypto Community pushing the virtues of EOS – take a look at Ralf and Tai giving a presentation at the Bitcoin Crypto Sydney meetup talking about all things EOS and Introducing our EOSToolkit. There have been endless requests for technical and non-technical issues that token holders are facing on a daily basis within the community. We try and help as many as we can but feel Telegram and other social channels are not the best platforms to retain information in an easy to find location. To address this issue, we have developed a GenerEOS Wiki platform that can be updated with Questions and Answers, detailed tutorials, and support mechanisms so that users can find all answers in a single easy to find location. The site is currently operational with testing underway while we curate useful content for the community. Keep an eye out for a launch post soon. We have been working with a well-known designer within the EOS Community to rebrand and give our website a much-needed facelift. It’s looking amazing, and we can’t wait to reveal it in the coming weeks. We will be soon releasing an update for the community on our six months (Q3 & Q4 2018) roadmap, which has some really exciting projects and collaborations that we are looking forward to announcing. Including, the first deployment of profits to Community Projects and worthy Charitable Organisations.